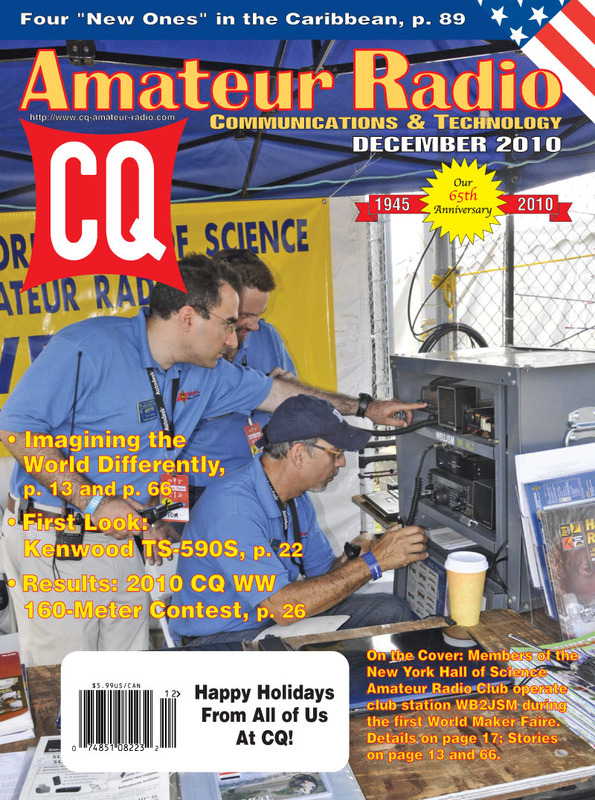 The December issue of CQ begins with "Imagining the World Differently," a report by CQ Editor Rich Moseson, W2VU, on what hams can learn from the first World Maker Faire in New York City. Next, Contributing Editor Gordon West, WB6NOA, shares his "First Look" at Kenwood's new HF/6m transceiver, the TS-590 (click on title to view video); followed by results of the 2010 CQ World Wide DX 160 Meter Contests. The top scorers included: CW - CN2R (W7EJ, op. ), K1DG, LX7I (DF1LON, op. ), VE3NE, OK2BYW, EF8M and K1LZ; SSB - D4C (IZ4DPV, op. ), K3ZM, E77DX, HG10P (HA3MY, op. ), HA8BE, CR2X and WE3C; SSB/CW Combined -VE3TA. We also have the rules for the 2011 CQ DX Marathon -- remember, the 2010 Marathon ends on December 31 and logs must be submitted by January 31, 2011. The recommended Excel® spreadsheet for reporting may be downloaded from <www.dxmarathon.com>. Note that the creation of four new DX "entities" in the Caribbean -- Curacao (PJ2), St. Maarten (PJ7), Bonaire (PJ4) and Saba/St. Eustatius (PJ5/6) -- on October 10 provides a one-time "double-dip" opportunity for Marathon entrants who contacted the islands both before and after their change of political status (see news articles). Plus: Final reminder that contacts for the special CQ Worked All Zones Diamond Jubilee Award must be made by the end of 2010, with logs received by Award Manager N5FG by March 31, 2011. We also have our annual index in this issue, for quick reference to every article that appeared in CQ during 2010. An updated Master Index from 1980-2010 will be posted here on our website. Among December's columns, "Math's Notes" editor Irwin Math, WA2NDM, offers advice for rescuing a piece of gear that has fallen in water; "Washington Readout" editor Fred Maia, W5YI, opens the Reader Mailbag, and Public Service Editor Richard Fisher, KI6SN, looks at a training exercise in "Surf City," also known as Huntington Beach, California. "Learning Curve" editor Rich Arland, K7SZ, completes his two-part series on "YoYo-72" -- preparing for the fact that, in a disaster, it's likely You'll be On Your Own for 72 hours. QRP Editor Cam Hartford, N6GA, brings us "Elmer, Doc and a Little Magic"; "Kids' Korner" takes a look at the World Maker Faire with a focus on its youth-centered activities; Kit-Building Editor Joe Eisenberg, K0NEB, discusses the best way to populate a circuit board while assembling a kit, and Digital Editor Don Rotolo, N2IRZ, looks at smart-phone applications of interest to hams. VHF Editor Joe Lynch, N6CL, brings us details on the forthcoming ARISSat satellite, due to be "launched" by hand from the International Space Station early in 2011; New Products Editor John Wood, WV5J, looks at holiday goodies for the ham shack; DX Editor Carl Smith, N4AA, brings us up to date on the changes in the former Netherlands Antilles, and Awards Editor Ted Melinosky, K1BV, answers some questions regarding the USA-CA Award and looks at a variety of interesting award programs around the world. Finally, Contesting Editor John Dorr, K1AR, asks the rhetorical question, "What's the Point of Contesting?" (Don't worry, he has an answer! 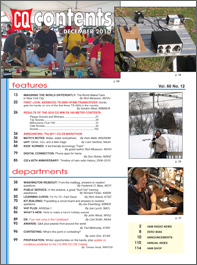 ), and Propagation Editor Tomas Hood, NW7US, focuses on wintertime DXing opportunities. That's a brief look at what's coming up in the December issue of CQ magazine, which should be on newsstands and in subscribers' mailboxes by late November. For information on becoming a CQ subscriber, click here. Happy holidays from all of us at CQ! 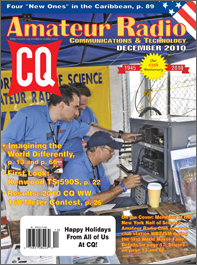 Zero Bias - "The Future of Ham Homebrewing"
On the Cover: Members of the New York Hall of Science Amateur Radio Club operate club station WB2JSM on the Hall of Science grounds during the first World Maker Faire.